CAYDEN Slykhuis looks to make a move against a defender during the Wolsey-Wessington match up on Saturday, Feb. 2. Coming off a good week with a big win over the Hanson boys, the Blackhawks were ready to take on a three-game week. It proved to be too much for them, however, as they ended the week with three losses added to their record. On Monday, Jan. 28, the Ethan Rustlers traveled to Forestburg for a doubleheader. The boys’ game was a tough one to the end, but the Blackhawks couldn’t pull out a victory as the game ended with a score of SCW 61, Ethan 68. The boys’ JV game ended with a score of SCW 48, Ethan 24. No other stats were available. 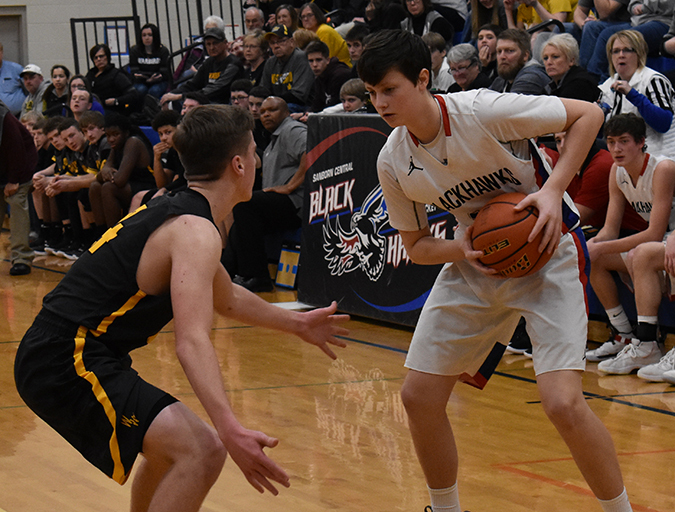 On Thursday, the Blackhawks were on the road to Corsica to take on the Corsica-Stickney Jaguars in a doubleheader. The junior varsity crew played first and took a loss with a final score of SCW 25, C-S 32. The varsity played another tough game to the end, but came up short with a final score of SCW 42, Corsica-Stickney 58. On Saturday, Feb. 2, the Blackhawks welcomed the Wolsey-Wessington Warbirds to Forestburg for their third doubleheader of the week and their second meeting with the Warbirds this season. The JV teams played first and the boys’ JV game was a rough, physical game to the end, and the young Blackhawks fell to the Warbirds with a final score of 30-36. The first encounter between the two varsity squads was during the 281 Conference Tournament in Huron and ended in a Blackhawk victory with a final score of 45-37. On Saturday night, the Blackhawks just couldn’t get things to gel and they fell to the Warbirds, 24-42. SCW fell to a record of 8-7, and they traveled to Iroquois on Tuesday, Feb. 5. Results of those games will be in next week’s issue of the Sanborn Weekly Journal. The Blackhawks then host Highmore-Harrold in Woonsocket on Friday, Feb. 8 for a doubleheader, and they play in the DWU Classic against Irene-Wakonda on Saturday. The full schedule of the DWU Classic is in this week’s issue. …Check out details and see an additional picture of the games in this week’s issue of the Sanborn Weekly Journal.